On Saturday 30th June, 180 swimmers from 18 different clubs descended on the annual Surrey County Masters (18+ years) Swimming Championships held at Surrey Sports Park in Guildford. Croydon Amphibians, who had come with a smaller team of 15 this year, were fit and raring to go. Up first was the 200m freestyle and Marianne Rooke-Allden put in a strong swim, just 3 hundredths of a second off her PB and a third place in her age category. Kevin Steele, John Woolley, Colin Lowans, Matt Stone and David Dale all stepped up for the men with Kevin (1st place), Matt (2nd) and David (3rd) in their respective age categories. Just some of the Croydon Amphibians Masters Team. There was success in the 50m breastsroke with Marianne and David Dale picking up another third place each, while Hiro Harazawa in the 18-24 age group claimed first place in a superb time of 32.11. Matt Stone was the only person to brave the 100m butterfly and was rewarded with a third place finish. In the 50m backstroke, a little more training on turns is obviously required, as there were three disqualifications for the men, but the ever impressive Kevin Steele brought things to order by coming in first place with a time of 33.25. There was also success for David Dale and Rosie Raynor, who both claimed second place for their respective age groups. In the 25m splash and dash events at the end of session 1, Kevin Steele once again claimed 1st place in the freestyle, while James Mulcahy picked up a third place finish in an impressive 11.60. For the women Rebecca Mulcahy, came first in both the freestyle and fly events, with Rosie Raynor not far behind in third place for the fly. Marianne, continuing her sterling efforts claimed yet another third place in the freestyle. Session 2 kicked off with the 25m backstroke and it was a good return for Croydon Amphibians as Kevin Steele brought home another 1st place while Aidan Martin, Matt Stone and David Dale brought home 3rd places in their respective age groups. For the women, Rosie Raynor came second while Marianne Rooke-Allden was just edged out into fourth. Up next was the 100m IM and Hiro Harazawa put in a sterling performance to win the 18-24 age group with a time of 1:04.28, the second quickest of the day. John Prowting, who almost didn’t swim on the day due to admin oversight, produced a good display to come home in second place while Matt Stone put in a solid performance as ever coming home in fourth. There was success for the women as Rebecca Mulcahy came first in her age group in a time of 1:14.06. In between the standard IM, was the event that everyone was looking forward to seeing – the IM Mystery Medley, which organiser Jim Boucher had added to the programme to add a bit fun to proceedings. Stroke order was pulled out of the hat in a ‘lucky-dip’ fashion, although it was not so lucky for some as they realised they had to swim fly on the last leg. Will Marston stepped up for Croydon’s Men and came home in second place with an impressive time of 1:11.30, while Marianne Rooke-Allden brought home another impressive third place. Returning to normal events Hiro Harazawa claimed first place once again in the 100m breastsroke while David Dale claimed second spot, John Prowting a third place and Marianne Rooke-Allden another third place to add to her medal haul. The 50m freestyle sprints followed and Kevin Steele stepped up once again to claim first place in an impressive time of 26.66, while Rebecca Mulcahy also claimed top spot for the women. 1 Men's 100m Freestyle Relay 72-99 years - James Mulcahy, Aidan Martin, John Prowting, Ben Dubben. Finishing off session 2 was the relays, which never fail to excite and rouse the crowd. Up first was the Men’s 100m Medley Relay and there was success for the younger squad members of James Mulcahy, Hiro Harazawa, Will Marsten and Ben Dubben as they came home in a time of 53.33 and claim a silver medal. In the 200-239 grouped age category, Kevin Steele, Matt Stone, Aidan Martin and Bob Kirk put in a solid performance coming home in 4th. In the Mixed 100m Medley Relay, James and Rebecca Mulcahy teamed up with Rosie Raynor and Hiro Harazawa to put in a fantastic swim and claim second place. Unfortunately there were no relays to report solely for the women as Croydon only had 3 female squad members, but we are all hoping that 2019 is more fruitful. The third and final session of the day started with a quick splash in the water with the 25m breastsroke. James Mulcahy won his age group for the men, while there were some solid swims from Aidan Martin, Colin Lowans, Matt Stone and John Woolley. For the women, the ever present Marianne Rooke-Allden claimed second place her in race. The next event saw the 100m backstroke and John Prowting continued his good form by swimming a 1:22.19 and claiming second place, while Rosie Raynor also collected some silverware by coming in second in a strongly swum race. For those that still had the strength in their arms, the 50m fly was up next and Rebecca Mulcahy certainly did, as she flew into silver medal position with a time of 33.11. Marianne Rooke-Allden continuing her heroics finished in third place. John Prowting and Matt Stone put in strong swims for the men picking up some well-earned points for the team. With little time to get the breath back the 100m freestyle was next and up stepped Matt Stone and Colin Lowans who put in good performances, but once again it was Marianne Rooke-Allden who took the race on for the women and to her credit picked up another bronze medal in her age group. Finishing off session 3 and the day as a whole were the final relays. And what a good finish for Croydon Amphibians it was, as the men of James Mulcahy, Aidan Martin, John Prowting and Ben Dubben, competing in the 100m Freestyle 72-99 years, came second in a stunning time of 52.03 and a nice silver medal to go home with. 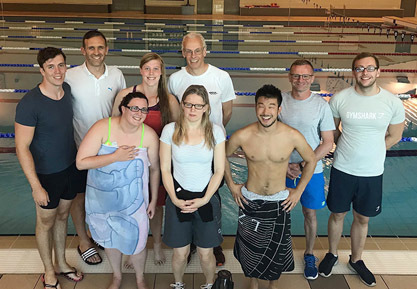 With no women’s team able to race, Rebecca Mulcahy and Rosie Raynor were able to join forces with Hiro Harazawa and James Mulcahy to swim in the Mixed 100m freestyle relay. In another superb time of 51.50 they also claimed second spot with a stunning performance. 1 Mixed 100m Freestyle Relay - Hiro Harazawa, Rosie Raynor, Rebecca Mulcahy, James Mulcahy. As the last swims were swum, the overall points were collated. For the women, considering there were only three representing Croydon this year, did considerably well by amassing 137 points and finishing 7th overall out of 13 teams. Guildford City were the clear winners with 795 points. For the men there were 18 teams contesting the title, but Croydon Amphibians should be proud as they finished fourth overall with an overall point score of 274. Guildford City were by far and away clear winners with 919 points, 561 more than second placed Godalming. In the overall combined team scores, Croydon Amphibians came a creditable 6th place out of 18 competing teams with a total score of 444. Guildford who brought with them a team of 70 swimmers won very comfortably with 1,847 points, so many congratulations to them. In the race for the Victor Ludorum titles, Marianne Rook-Allden who put in some very impressive swims throughout the whole day, collected an individual score of 71 points to come fourth overall out of 19 swimmers in her respective age category. Rebecca Mulcahy (39 points) and Rosie Raynor (27 points) came a respectable 4th and 9th for their age group. While for the men, Kevin Steele who had a very impressive day with a number of first place finishes, just missed out on the title by one solitary point for his age group. Matt Stone also came an impressive second place, while David Dale, who was one of the most impressive swimmers on the day for Croydon for his positive attitude and superb stamina, came a brilliant fourth place. Very well done to all of you, we are all very proud. Special thanks to Rebecca Mulcahy, Aidan Martin and Pam Pollington for organising. Let’s go again next year (hopefully with one or two more swimmers).